Here’s the latest example of why newspapers are dying. The Orange County Register has announced it is outsourcing many of its editing jobs to India. The paper has gone through three rounds of layoffs in the past year. The latest was in April when they cut 90 jobs. All newspapers are declining in circulation and ad sales but the OCR has been hit particularly hard. They recently dropped from the third-largest newspaper in California to the fifth-largest, behind the Los Angeles Times, San Francisco Chronicle, San Diego Union-Tribune and Sacramento Bee. 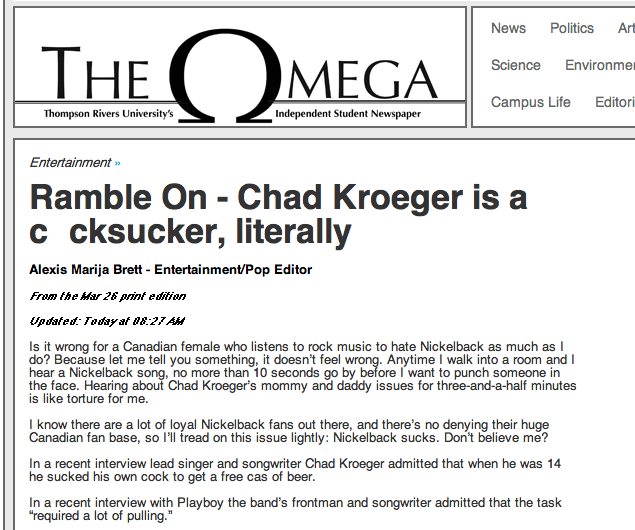 This is from a Canadian college newspaper.